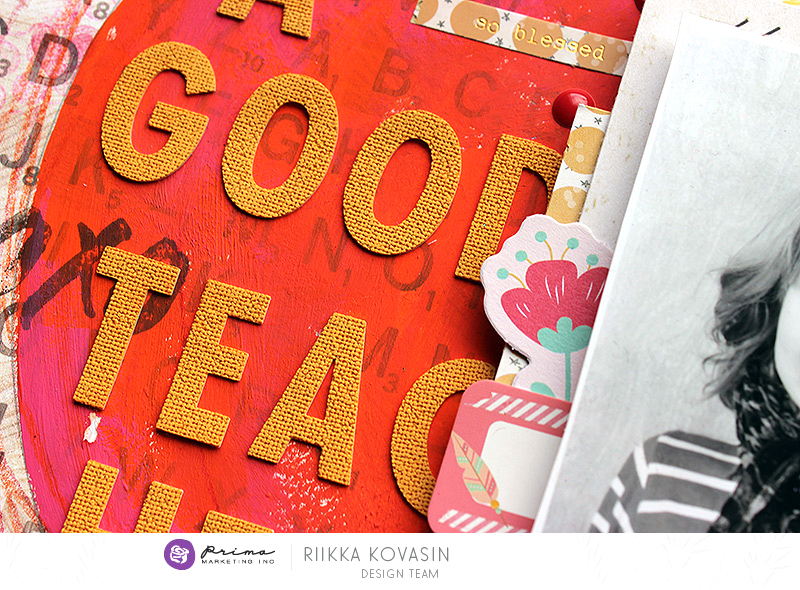 It's Tutorial Thursday and we are here with some fabulous tips from mom and scrapbooker, Riikka Kovasin! She will share a few ideas on how to scrapbook with your children, while also saving some of their artwork from school! Riikka is so organized, as you will soon see, and has a lovely tutorial for you, so let's get scrolling! Hi there! It’s Riikka here to share another layout with you. I started to think of what to do, or rather, what angle to take on scrapbooking and, especially, helpful tips. It’s still July, but the schools are starting soon again here, so I thought to use that spark in my layout and incorporate elements my daughter made to the page. The drawing I added here is actually a couple of years old, but it could be her teacher. I used the drawing to narrow down my color scheme – pinks and oranges. I also chose the background paper with the school theme in mind – the Scrabble-looking alphabet tiles seemed really appropriate! Another angle on how my daughter participated with the layout is something you can’t see – it’s the journaling, hidden inside a little envelope behind the photo. This is something you can use if you don’t want the journaling to show, but want to incorporate it to the page somehow. Tip 1. Seeing doubles and triples? Nope, it’s just a couple of photos I have stored for scrapbook layouts. I don’t own a photo printer but order my photos so I tend to order a lot at one go. I always try to keep some shots of my two girls, my husband and me in my “scrapbook these” photo folder so I can do a page about them. They are just random, fun pictures without a story of their own. Tip 2. Let others shine! If you have kids you probably know how much art they create. It’s impossible to save all, but I try to keep some drawings that I find somehow inspirational in my own storage, so I can use them in layouts or other projects. They aren’t the best ones, as they are stored elsewhere, but just something I could see as a part of a project. Tip 3. Out of sight but always in mind – at least when you open the envelope or pull out a tag. If you don’t want the journaling to be a visible part of the page, there’s a lot of options. Just stash it in an envelope, a little glassine pouch or a pocket. Just remember NOT to use a stapler to add it to the paper layers or you can’t use it. Or even worse, the journaling already inside will stay hidden! Riikka is such a joy to have on our team. She brings so much talent, product knowledge, and fabulous solutions for real-life memory keeping! Time to Flirt A Bit!